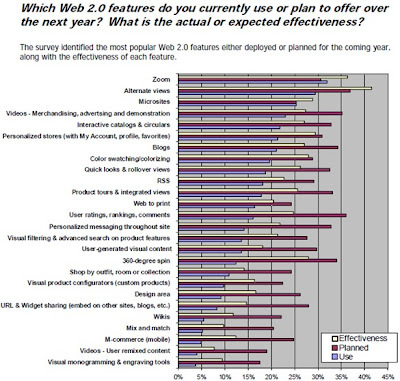 Half of online businesses plan to add "Web 2.0" online capabilities to their sites in six months. Over 93 percent intend to do so within the year, according to a Scene7 study of retailers, manufacturers, agencies, and high-tech companies that sell products or services online, reports MarketingCharts. Which sounds awesome, until you look into the data and realize that Web 2.0 describes pretty much anything you can do online, besides text and HTML tables. 360-Degree Spin?? Videos?? Not even user-generated 360-degree spins? Just another example of Caveat Regurgitator. I'd still like someone to calmly, cleary and sanely explain what Web 2.0 is. Then maybe I'll buy one. Errr, some? Zoom!?!?! I can't believe it! finally companies are embracing the zoom functionality that i keep hearing so much about! too funny, we all deserve to have our data displayed right alongside our "insights".